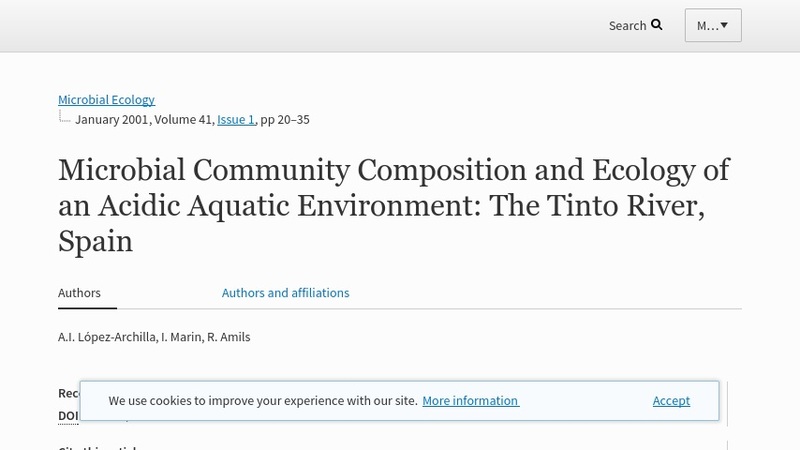 This journal article examines the correlation between physicochemical and biological characteristics of the Rio Tinto in Spain. It explains that the extreme acidic environment of the Rio Tinto is due to the metabolic activity of chemolithotrophic microorganisms. The article includes an illustration depicting the geographical position of the Rio Tinto with highlighted sampling and mining sites, tables indicating the values of physio-chemical parameters measured in different seasons and in different rivers, a table listing the taxonomic classification of different microbial groups in the Rio Tinto, a table examining the seasonality of microorganism populations in different sampling sites, phenotypic properties of different sulfur-oxidizing bacteria, and a correlation analysis. A paid subscription to SpringerLink is required to view this article.